How fun is makeup created by a 3-D printer? Would you wear a bracelet that tracks energy usage to curb your carbon footprint? Ever wonder how well the laborers who dug up your diamond are making a living? Cool technology innovations and concerns for people and the planet are evolving the demands of consumers who can afford the most tony of lifestyle purchases. These consumers want the best, and they increasingly want to know they can trust brands to be socially conscious. 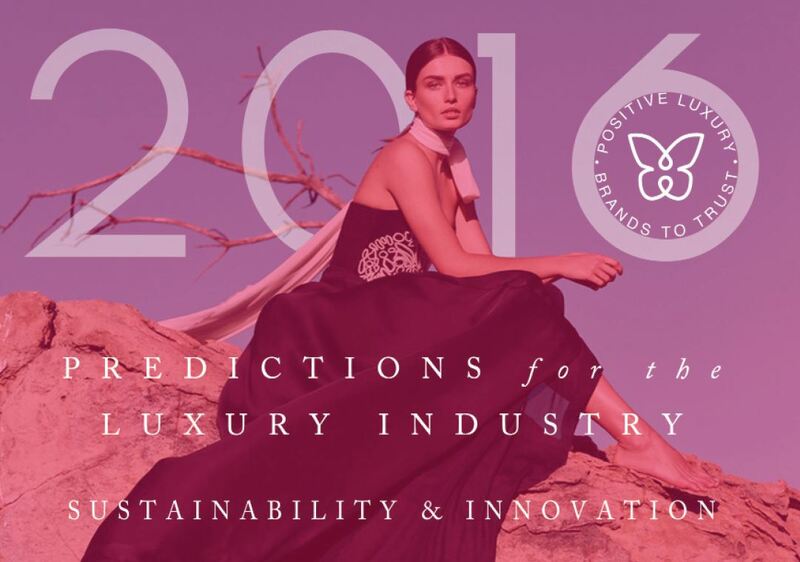 In a new report, the industry group Positive Luxury analyzes market forces and predicts trends in sustainability of the luxury industry. Investors are asking about the social and environmental impacts of companies with longer-term views about their connections to profits. Celebrities are touting good global citizenship along with lifestyle campaigns. In the U.K., businesses must now publish an annual statement on slavery and human trafficking, a move designed to make them take responsibility for labor practices in their supply chains. The global climate talks in Paris (COP21) moved forward the world's efforts to slow climate change, with a goal to keep the annual rise in temperature below 2 degrees Celsius. Positive Luxury reports: "With the power of collective action to cut carbon emissions, the deal will have a direct effect on all businesses, especially luxury companies that focus on sustainability." Saving energy and reducing pollution have become the norm for more businesses, and it's often expected of those seeking luxury products. Sourcing high-quality raw materials is essential for businesses using everything from organic cotton to cashmere and silk. Yet, rural and coastal communities around the globe are at risk from weather extremes that could mean droughts, floods or even loss of agricultural land. Luxury brands must strategically plan for long-term sourcing. Customers shopping on mobile devices and luxury brands using social media to interact are strong trends reflected in the report. Product development is rapidly changing due to technological advances. Also mentioned is how big data, when analyzed well, can help companies innovate. Prada and Nordstrom are developing dressing rooms with mirrors that double as interactive screens. Despite growing electronic commerce, luxury brands that stand out are also supporting brick-and-mortar stores. Positive Luxury reports that more global brands opened physical stores in 2015, often enriching local communities with jobs. Researchers say millennials and Gen Xers, with their growing disposable incomes, are demanding more social responsibility from brands than earlier generations. They care how the money they spend impacts workers and the environment. Luxury brands that want their business must effectively communicate how social consciousness is ingrained with their products and services. It's noted that a leading economist for Goldman Sachs recognized growing economies early this century in Brazil, Russia, India and China. Positive Luxury also cites growth potential in less prominent countries such as Indonesia, Sri Lanka, the Philippines, Bangladesh, Tanzania, Kenya, Zambia, Ethiopia, Colombia and Peru. However, luxury spending seems to be slowing in China, along with its economy, despite that country being the top market for luxury consumer goods. Luxury brands are finding new and innovative ways to reach consumers. In addition to traditional brick-and-mortar, they are connecting with shoppers online. Consumers increasingly expect to find the same selection both in person and online. Luxury spending doesn't have to be conspicuous consumption on goods. Instead, millennials are noted for investing in quality experiences such as live entertainment. Brands can score big as event hosts. Consumers also enjoy using technology to connect before (buying tickets), during (connecting via social media) and after the live experience. One of the most basic ways consumers understand sustainability is that it means products are less wasteful and last longer. This requires high-quality materials and science-driven innovation. The result can be old-fashioned durability of a product that won't need replacing anytime soon. How can innovative, sustainable ideas inform the modern perception of luxury? The cosmetics world will be forever changed by Grace Choi's introduction of a 3-D makeup printer that could let you choose custom colors on demand. A wristband by Worldbeing made of recycled electrical components can keep track of carbon emissions to monitor your daily carbon footprint. The De Beers Group of companies touts its Forevermark line of diamonds for their responsible sourcing. The brand supports advancement of women in careers as miners, geologists and engineers in Africa. Innovation in the luxury industry can wow consumers with the latest products, while mission-driven sustainability practices can earn customer loyalty. In its conclusion, Positive Luxury restates, "In general, people want to align with brands that represent their values and care about the things they care about." Positive Luxury issues participating brands the Butterfly Mark as a third-party certification of commitment to sustainability.